Two statues dedicated to historical Armenian figures unveiled in Yerevan last week have become a subject of heated public debate around esthetics as well as other aspects of their installment. 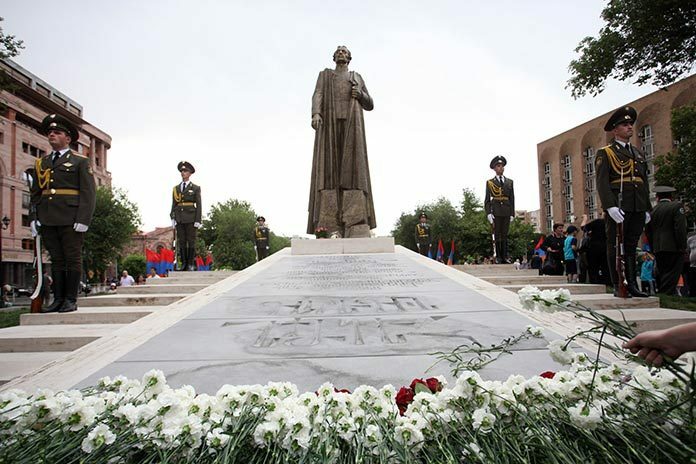 First, a statue to Soviet-Armenian Marshal Hamazasp Babadzhanian (1906-1977) was ceremonially unveiled in the Avan district of Yerevan on May 23 and then on May 28, Armenia’s First Republic Day, a statue to Garegin Nzhdeh (1886-1955), a military commander and thinker, was inaugurated not far from the city’s central Republic Square. 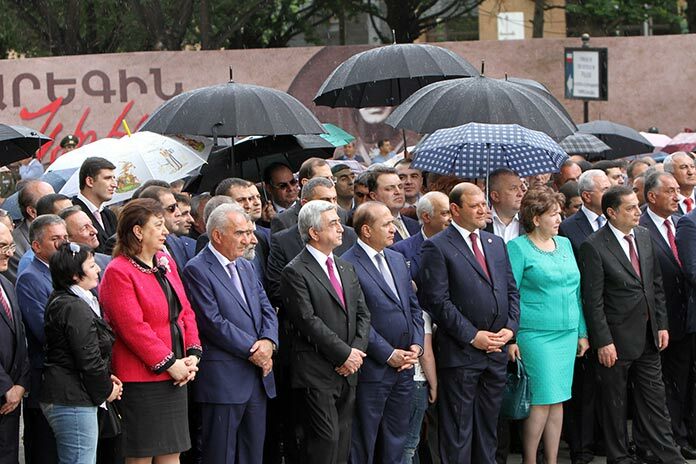 President Serzh Sargsyan and other members of the political and military leadership of the country attended both ceremonies. Meanwhile, during the week social media were full of poignant commentaries and opinions regarding both statues. 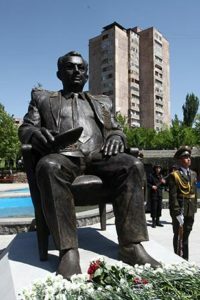 The sculptor of the Babadzhanian monument was, in particular, criticized for creating a seated figure – something that critics argue is more typical of “crime lord tombstone statue culture”. Besides, some controversially challenged the very decision to install a monument in honor of the former chief marshal of the armored troops of the Soviet Union who, besides participating in operations against Nazi Germany during World War II, also commanded the Soviet mechanized army in Budapest during the USSR’s intervention that led to the bloody suppression of the Hungarian Revolution of 1956. On the Nzhdeh monuments critics first of all noted the lack of similarities with the popularly known fedayi images of the leader of the Armenian national-liberation movement of the early 20th century. They claim that the statue is a mixture of the body of fictional Star War character Darth Vader and the head of Russian Tsar Peter the Great. Besides, some find it odd that Nzhdeh’s monument was installed not on the square in Yerevan bearing his name. Nzhdeh Square in Yerevan’s Shengavit district, which was named after Suren Spandaryan during the Soviet times, still has the statue of this prominent Armenian Bolshevik. In his comments to the media Deputy Mayor of Yerevan Karo Areyan dismissed the criticism last week. Citing the examples of the equestrian statues to Vardan Mamikoyan, a 4th-5th century Armenian military leader, a martyr and a saint of the Armenian Church, and David of Sassoun, the main hero of Armenia’s national epic, he said that new monuments very often were taken with criticism by Yerevan residents. But then, he said, people got accustomed to these monuments that become inseparable parts of the city. Areyan also reminded media about the harsh criticism leveled at the sculptor and the authorities over the installation of what was at first described as a grotesque statue to Soviet-Armenian composer Arno Babajanyan in 2003. “But now you can see every day how children play around this monument, how people have their pictures taken against its background. This is the effect of the city’s living environment as monuments should be in contact with people,” the Yerevan official said. Areyan also dismissed criticism about the seated posture of Marshal Babadzhanian, saying that one should not mistake it for “cemetery crafts”. As for Nzhdeh’s appearance, he said that it was the way the sculptor saw it and found appropriate. “Personally, I more like Nzhdeh in his fedayi helmet, but it is my personal opinion and, perhaps, as a monument it would not have been the best option,” he said. As for the location of the Nzhdeh statue, Areyan said that the square in Shengavit that bears his name would not be the best place for it as even the current monument to Suren Spandaryan there is inconvenient in terms of public access. “I think the location chosen for Nzhdeh’s monument is more convenient,” he explained.